There are practically no Arab takers of Russia’s underhanded offer to play peace facilitator in Syria. Two think pieces appearing today in the leading Saudi daily Asharq Alawsat explain why. One by Abdul Rahman al-Rashed, head of Alarabiya TV news channel, says “it is too late” for Moscow now to change from warmonger to peacemaker. The other, by Lebanese journalist, author and political analyst Samir Atallah, draws parallels between the visits to Moscow of Syria’s Deputy Foreign Minister Faisal Mekdad this week and of Iraq’s Tariq Aziz in the buildup to the 2003 Iraq invasion. I don’t understand this insistence over the past year and a half on trying to convince the Russians to renounce Assad’s regime in Syria despite the Kremlin’s intransigence. Why is Russia still the focus of the Arab drive to stop the genocide against the Syrian people? The Kremlin’s lord and master, Vladimir Putin, has been unambiguous and resolute in his dogged support of Bashar al-Assad, providing him with weapons and experts, shielding him at the UN Security Council and defending him in international forums. He even printed bank notes for Assad to bypass sanctions on minting the Syrian currency in Europe. In the beginning, we gave Russia the benefit of the doubt. Gulf delegations and representatives of Syrian opposition forces flocked to Moscow bearing promises and gifts to try to solve the puzzle. We thought the Russians probably believed Assad’s arguments or feared for their interests, or worried about Islamist extremists, or sought material gains. All these concerns were raised and addressed, but to no avail. Now, a year after all those visits, meetings, gifts and deals, it seems the reason is irrelevant. The only remaining conclusion is that Russia will stand by Bashar to the end, even as she begins to use endearing phraseology to justify her shameful positions. Even if Russia now changed her stand, it would be too late to be helpful. The Russians helped prolong the war and they shared in killing 50,000 human lives, in destroying most Syrian cities and in displacing three million people. What use is Russia’s stance today? Zilch. If the Russians were to abandon Assad in the present day, he would fall in a month. If they didn’t, he would fall in two months. It is too late to try and reduce Syria’s losses. Cessation of the war will only cut the losses of Assad and his clique. We pinned hopes on the Russians intervening during the past 20 months, for them to be partners in peacemaking. Instead, they chose, together with Iran, to be Assad’s partners in crime. We pinned hopes on an early cessation of the hemorrhage so as to preempt grudges and acts of revenge and build a civil state representing all Syrians. But prolongation of the conflict by Assad’s allies paved the ground for the emergence of terrorist groups and internecine rifts. There is no room left for a smooth and peaceful transition of the kind branded about by good-intentioned people, such as international Special Envoy Lakhdar Brahimi. So why pay heed to the Russians and make the pilgrimage to Moscow, which only led Syria to a quagmire of blood? We’re fully aware Bashar’s regime has been prone to crumble for more than a year, running short on fuel for tanks and ammunition for warplanes to continue pounding the cities daily for eight months. We knew, and so did the Russians, that no regime, regardless of its military muscle, can withstand a mass revolt. The outcome is certain, save for the date of the regime’s fall. For that reason, we no longer want any pleading with the Russians to continue. The cemeteries, the widows, the orphans, the bereaved and the wounded won’t accept any of the solutions the Russians propose or approve. 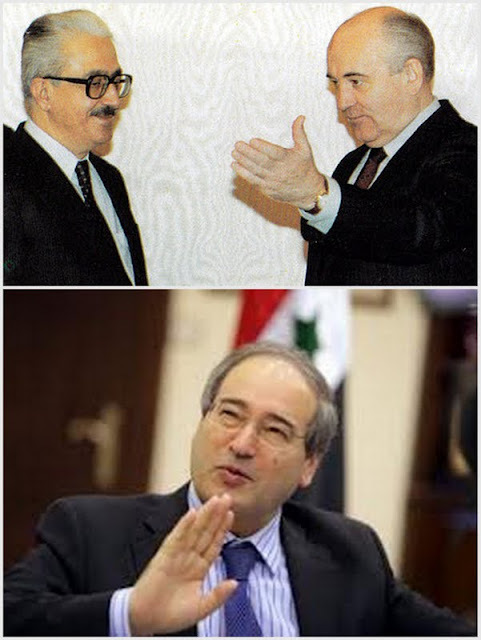 A few months ago, when Damascus airport was still open, Syrian Foreign Minister Walid Muallem flew to Moscow in person. He later told the world that everything was hunky-dory with his friend Sergei Lavrov. Russia’s friends, Atallah counsels, need to carefully read Gorbachev’s “Memoirs” and the latest book of Yevgeny Primakov [“Russia and the Arabs: Behind the Scenes in the Middle East from the Cold War to the Present”] to spare themselves false hopes and their peoples sanctions, death and destruction. “In matters of Law,” Atallah wraps up, “there is something called ‘precedent.’ The word is often used in legal proceedings.